David Slews the Giant Goliath with a Slingshot, Netanyahu Attempts to Rewrite the Bible Story by Declaring war on Palestinian “Terrorism by Stones”. Since a boy named David slew the giant Goliath with a slingshot, the stone has served as an enduring symbol of how the weak can defeat an oppressor. For the past month Israeli prime minister Benjamin Netanyahu has tried to rewrite the Bible story by declaring war on what he terms Palestinian “terrorism by stones”. There are echoes of Yitzhak Rabin’s response nearly 30 years ago when, as defence minister, he ordered soldiers to “break bones” to stop a Palestinian uprising, often referred to as the “intifada of stones”, against the Israeli occupation. Terrified by the symbolism of women and children throwing stones at one of the world’s strongest armies, Rabin hoped broken arms would deprive Palestinians of the power to wield their lowly weapon. Now the West Bank and Jerusalem are on fire again, as Palestinian youths clash with the same oppressors. Reports suggest soldiers killed one Palestinian youth and injured more than 100 others on Sunday alone. The touchpaper is Israel’s transgressions at the al-Aqsa mosque compound, known as Haram Al Sharif, in Jerusalem’s Old City. During the weeks of Israel’s high holidays, tensions have risen sharply. Israeli government ministers and ever larger numbers of Jewish ultra-nationalists, backed by paramilitary forces, have been ascending to the mosque area. In parallel, Palestinian access has been restricted and settlers have stepped up seizures of homes in occupied East Jerusalem to encircle al-Aqsa. Palestinians believe Israel is asserting control over the site to change the status quo. Israel refers to the Haram as the Temple Mount, because the ruins of two ancient Jewish temples supposedly lie underneath. As Israel has swung to the right politically and religiously, government and settler circles have been swept by an aggressive Jewish messianism. Palestinian efforts to resist have been limited. Israel has long barred Palestinian factions and organisations from any dealings in the city it calls its “eternal capital”. The situation at al-Aqsa has come to symbolise the Palestinian story of dispossession. The mosque has also served as a red line, both because it is a powerful cause that unites all Palestinians, including Christians and the secular, and because it rallies the wider Arab world to the Palestinians’ side. But like Goliath, the Israeli prime minister appears to assume greater force will win. First, he outlawed last month a group of Islamic students, many of them women, known as the Murabitoun, stationed at Al Aqsa. They had not even resorted to stones. Their crime was to try to deter Jewish extremists from praying at the site by crying “God is great”. Then, Israeli police stormed the compound to evict youths who had barricaded themselves in. Severe restrictions on access to al-Aqsa followed. As youngsters took to the streets, Netanyahu authorised live fire against stone-throwers in Jerusalem, and minimum four-year jail sentences for those arrested. Predictably, violence has not calmed but spiralled. On Saturday night a Palestinian youth stabbed to death two Jewish settlers who had been visiting the Western Wall, near al-Aqsa. 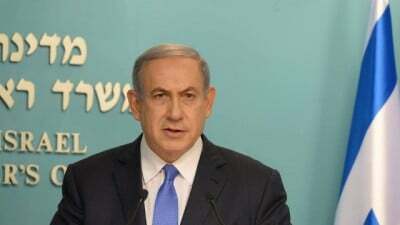 Israel has described such incidents as “lone-wolf attacks”. In truth, these unpredictable outbursts of violence are the inevitable result of the orphaned status of Palestinians in Jerusalem. Israel responded with another unprecedented move. Palestinians were banned from the Old City for the following 48 hours unless they lived or worked there. Israel’s track record suggests this will soon become the new norm. Netanyahu also approved fast-track demolitions of Palestinian homes, more soldiers in Jerusalem and even tighter restrictions at al-Aqsa. So where is this heading? Doubtless, Netanyahu is in part proving his credentials to an ever more religious and intolerant Israeli public. After Saturday’s deaths, Jewish mobs once again patrolled Jerusalem’s streets seeking vengeance. But he is also cynically exploiting western fears to reinvent the David and Goliath story. He hopes the words “Islamic terrorism” – conjuring up ISIL’s threats to religious freedom – will scotch western sympathy for Palestinian youths facing armed soldiers. Mahmoud Abbas, the Palestinian president, warned in his speech to the UN last week that Israeli measures were “aimed at imposing a new reality and dividing Haram Al Sharif temporally”. These are not idle fears. In 1994 Israel capitalised on a horrific massacre of Palestinians perpetrated by a Jewish settler at the Ibrahimi mosque in Hebron to justify dividing it. Today, Jews have prayer rights at the site, enforced by Israeli guns, and central Hebron has been turned into a ghost-town – much as Jerusalem’s Old City looks since the weekend ban on entry for Palestinians. Most Palestinians fear an Israeli-engineered spiral of violence will be used to impose a similar division at al-Aqsa. There is little Abbas can do. His Palestinian Authority is barred from Jerusalem and committed to helping Israeli security elsewhere. Like the Muslim world, he watches helplessly from afar. Which is why Palestinian youths will continue reaching for the humble stone, exerting what little power they have against a modern Goliath.